NARJOT, Ernest Etienne (1826-1898), artist born in St. Malo, France and raised in Paris by artist parents. He received formal art training there but was distracted from that pursuit by his interest in gold mining, which lured him to America. Narjot participated in the 1849 California gold rush, but was a mining failure. 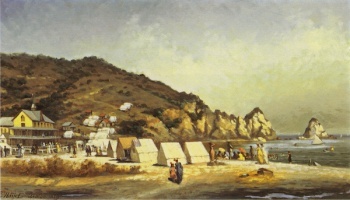 By 1865, he settled in San Francisco where he had a studio on Clay Street and painted landscapes, portraits, and sketches of gold miners and Indians and did murals and frescoes for churches and public buildings. A major achievement in his career was the commission to decorate the ceiling of Leland Stanford's tomb. While working on this project, he splashed paint in his eye which led to blindness. By the 1880s, he was considered one of California's foremost painters and also illustrated books of early California life. He died impoverished, and many of his works were destroyed in the San Francisco earthquake of 1906. Today his works are in the collections of the Los Angeles County Museum of Art, the Oakland Museum and the Bancroft Library at the University of California, Berkeley. 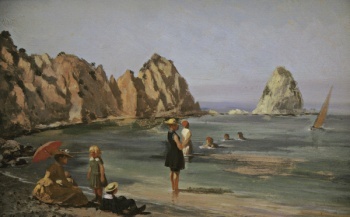 In the late 1880s, Narjot was one of the first professional artists to visit and paint on Santa Catalina Island.